Sacred Valley, Peru—For three years, between 2012 and 2015, TRIP made annual grants to develop community-based tourism and local economic development in a remote area of Peru by gently opening Huilloc ways of life to visitors. TRIP supported a three-year, multifaceted program of sustainable business planning, skills training and visitor knowledge resulting in the launch of 30 ecological homestays and other traditional mountain and farming activities-based income with the Lima Tours Foundation and the Leader of the Huilloc Community. Located in the heart of the Sacred Valley, the Huilloc Quechuans are descendants of the Inkas and have maintained a remote village and traditional customs near the World Heritage Site of Machu Picchu. 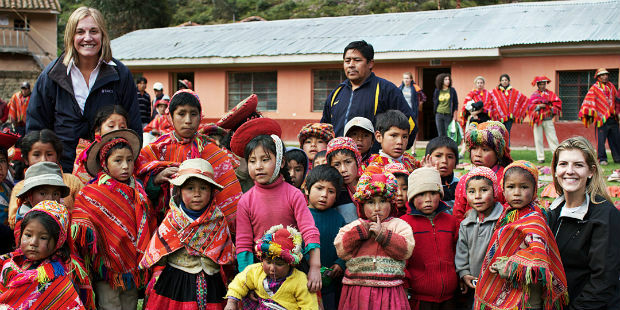 Approximately 300 citizens are porters on the Inca Trail; Huilloc women are renown weavers and raise their children with traditional Incan values. As a foundation investing in cultural impact, measurement is crucial and is often one of the more difficult aspects of our work. Did we make a difference? From 2011 to 2013, visits to Huilloc surged from 400 to 2,200 day or overnight guests from around the world. More than 35 percent of Huilloc families experienced a substantial increase in economic growth—and in many cases household income doubled. In addition to homestays, Huilloc are delighted to now be able to make income as artisans, musicians, cooks, dancers and farming guides. A survey in Quechuan language was provided to youth to elders to assess impact. In the first years, $30,000.00 of new income allowed the tribe to afford better health care and education, and the local school has been enhanced and improved. Two unexpected dividends have occurred during the grant cycles. First, the influx of visitors has not disrupted the communities’ peace, traditions or families. Second, the local children are enjoying the visitors and new pride and respect that arise from multi-cultural friendships—the ongoing visitations help improve their quality of life and encourage Huilloc villagers to preserve their traditions. A branding symbol of the tribe was created by the community and multilingual handouts aid the visitors to have an in-depth understanding. As of this writing, an interpretation center is planned.